In the late 1960s, the Soviet Air Force was working to get a new generation of supersonic medium bomber into the inventory. This aircraft would become the topic of many heated diplomatic discussions during the Cold War as it was viewed quite differently between Moscow and the west. To Moscow, this aircraft was a natural evolution of the Tu-22 (Blinder) and was therefore within the permissible scope of the relevant arms treaties. The west believed that this aircraft was a completely different development and the only commonality between what was code-named Blinder and Backfire was perhaps the cockpit clock. Nevertheless, the Soviets moved ahead with development of this very capable twin-engined supersonic strike aircraft. In the rear of the title, there are color profiles of the Tu-22M-2 and Tu-22M-3 versions and line drawings of the Tu022M-3. 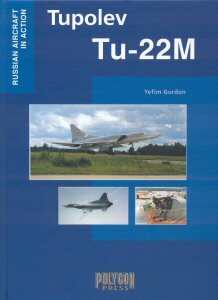 The Soviet/Russian aviation historian and modeler alike will want to add this to their reference libraries - especially considering the very reasonable retail price! The photography and printing quality is very well done. This title is highly recommended!